The local Latino community made a strong showing at Saturday's Latino Conservation Week celebration in Hot Springs National Park, and one of the event's organizers said it may have sparked some long-term interest in the process. Hot Springs National Park hosted an open educational fair from 10 a.m. to 2 p.m. Saturday on Arlington Lawn, offering educational opportunities for the public to learn about a variety of subjects in both Spanish and English. The celebration served as the centerpiece for the national park's observation of Latino Conservation Week from July 15-23, the first of its kind held in the state of Arkansas. Miguel Marquez, supervisory park ranger and overseer of the celebration, said he was pleased with the outcome. "I'm really happy on who came, and the audience we're trying to reach," he said. Marquez said that the celebration has possibly yielded long-term interest in the park from the local Latino community. He said that several bilingual individuals signed up to volunteer at the national park, and that the volunteers from a pickup held earlier in the day expressed interest in making it an ongoing effort. "They already told us, 'Let's do this monthly, let's do this weekly,'" he said. "The elderly, the young, they were all gung-ho and excited about cleaning up. I was amazed, and just saw the input and the help, and wanting to help." HSNP Latino Heritage intern Luis Vidal said that park officials noticed a lack of Latino representation in the national park, and the event was created in response. The celebration's first event -- a two-hour trash pickup in the national park that began at 8 a.m. -- was attended by 40 volunteers from St. John's Catholic Church's Hispanic mass. Ramiro Roblero, one of the trash pickup's volunteers, said that the event was the first time he had ever been in the national park. He described its landscape as "very beautiful." Vidal said that the event fulfilled the national park's purpose. "They went out, they got out on the trails, they loved it," he said. "Many people were taking pictures." "They were all so excited," Marquez said. 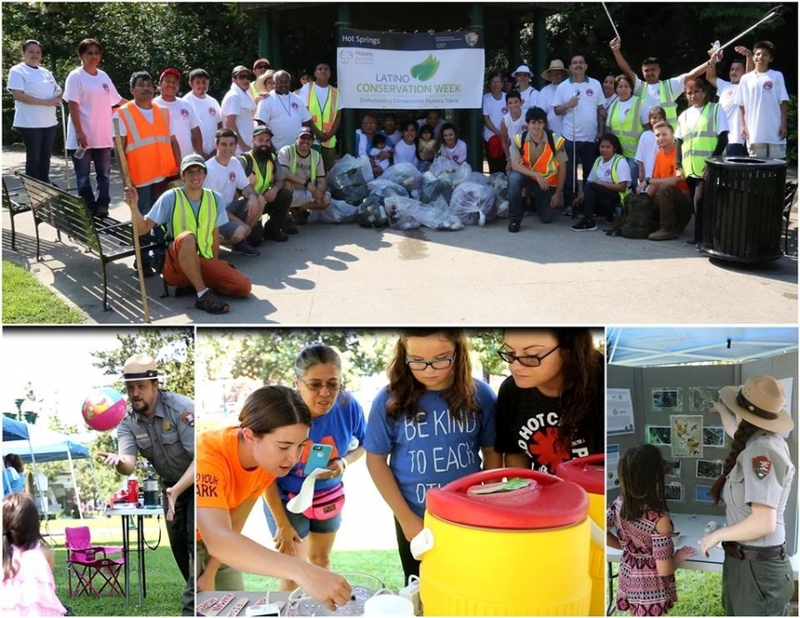 "The Latino community is just so passionate about helping the park." The educational fair, which was held immediately after the trash pickup, offered bilingual programs that touched on concepts such as the national park's cultural resources, natural resources, artifacts and leave-no-trace ethics. Unlike the trash pickup, this event was an inclusive one that was open to the public. Vidal said that the educational fair was a unique opportunity for participation by the Hot Springs community as a whole. "It's not often we have park rangers out here on the lawn, or just out there in general," he said. Marquez cited Saturday's celebration as Latino Conservation Week's largest event in the Midwest region. He said he was personally pleased with the outcome, and would like to see the national park participate in the weeklong celebration for years to come. "We see today that the Latino community is strong here," he said. "They showed, and they are represented."